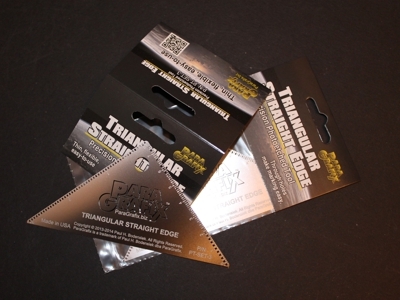 Precision photoetched triangular straight edge. Includes both metric and imperial measurements. Through holes sized for mechanical pencil leads are located every 1/16 inch and 2 mm to make marking simple. The large hole at the apex makes for a convenient hanger so the tool is always close at hand.